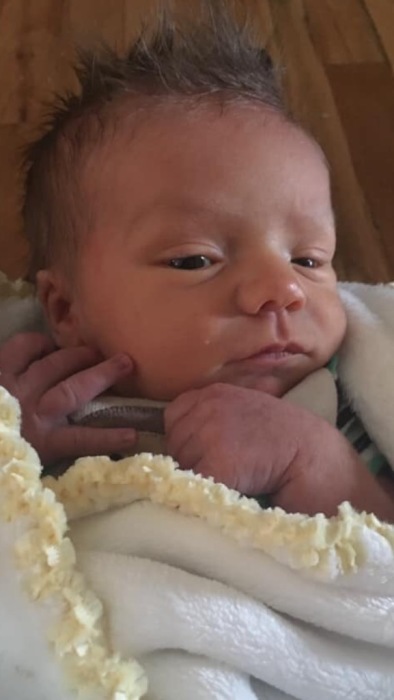 Ace Glen Jensen, age 17 days, passed away in his loving mother’s arms on April 7, 2019 at Primary Children’s Hospital in Salt Lake City ,Utah of a short illness. Born March 21, 2019, Ace passed gently into the arms of Jesus. Ace is the son of Ashley K Millward Jensen and Larry J. Jensen, Jr.
and grandparents Clyde and Alice Jensen. A Memorial Service will be held at 11:00 am on Saturday, April 13, 2019 at the Clark 2nd Ward Church, 81 North Church St., Grantsville, UT. A viewing will be held one hour prior to the service at 10:00 am. Interment will follow at Grantsville City Cemetery. A fund has been set up to help with the funeral expenses in the name of Ace Jensen Benefit Memorial Fund at Wells Fargo bank or at Venmo under Susan K. Orifici.